At NYU, the grad students keep each other from being lost to reality by giving talks each Friday on a topic that isn’t physics. It’s called the Intellectually Stimulating Craic. In the recent past, students have given talks about Soviet prison tattoos, mind-controlling parasites, and Michael Larson scamming the 1980s game show “Press Your Luck” (the organizer of the talks, Cato, keeps a full record here). 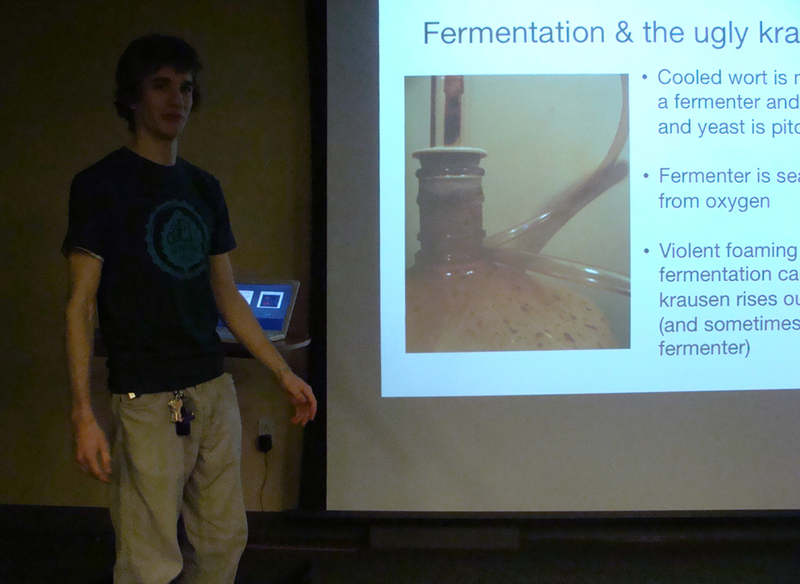 The past week, I gave a talk about homebrewing. And of course the best talks have no shortage of demos or props. According to the audience, I did not disappoint. Don’t worry, none went to waste. Hopefully the NYU physics department will soon be home to quite a few new homebrewers. My beer was very well received by everyone who attended, and in fact I think it’s gotten better over the last couple of weeks. There are now just two of these beers left, although the next beer, Colleen’s coffee stout, is now into bottles and carbonating, and tomorrow I will brew yet another. The coffee stout continues to slowly improve, but still has some undesirable characteristics that will hopefully fade in the coming weeks. The beer wasn’t only well received for its drinking, but it had also been fashioned with some stylish duds. Colleen, who is tremendously talented in all things visual, musical, or at all creative. Professionally she is a graphic designer who has generously created t-shirts, posters, and many things more wonderful still. So without further ado, Colleen’s label for the Intellectually Stimulating Ale. This entry was posted in beer and tagged brown ale, first brew, narrative on March 10, 2013 by Dylan Bargteil.